and history from the only complete Tyndale Bible in the World, we supplied the dimensions, images and history of our unique Tyndale N.T. 1534 for the National Geographic's reproduction of their William Tyndale Bible used in their production. Our William Tyndale N.T. 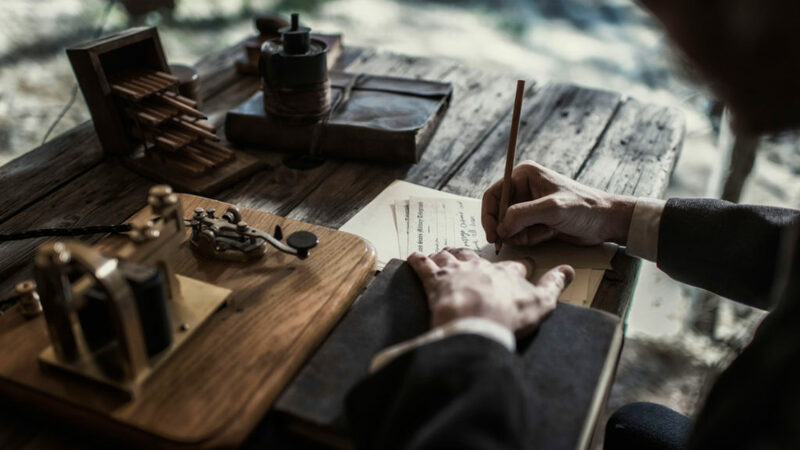 1534 was then used in this National Geographic million dollar production of, ‘Origins' "Writing on the Wall" What an Honour for our company, Tyndale Bible 1534. William Tyndale's New Testament of Our Lord Jesus Christ of 1534; is Complete, and the only complete copy in the world. As far as can be ascertained from the various Auction Records World-Wide,and list of known books in world -wide Libraries. No complete copy of Tyndale's New Testament of Our Lord Jesus Christ of 1534;- has ever come to the auction market to be sold and no copy of Tyndale's N.T. 1534 complete, sits in any Library, or Museum or University in the World. We here at Tyndale Bible 1534 own the sole surviving copy of this remarkable rare Bible. We intend in the coming weeks to reproduce an exact copy of our Tyndale Bible 1534 for public sale. We have been asked over the years to produce a facsimile copy of our great book, ​Tyndale's N.T. 1534. and this we intend to do. Without William Tyndale, and his Bible in English there would have been no Shakespeare, nor none of the great English Poets, like Donne, Drayton, Fletcher, Marlowe, Raleigh, Spenser, Sidney, no English Bibles, like the Coverdale's Bible, Matthew's Bible, Cromwell's Bible, Canmer's Bible, Geneva's Bible, Bishop's Bible, King James's Bible of 1611, no modern day English Language. William Tyndale was the Father of the English Bible and he, William Tyndale, also gave us the modern English Language, we use today. Fairly clean throughout, with old antiquarian hand written notes on a few pages. 39 illustrations to the last 100 pages. The 39 woodcuts include small woodcuts of the Four Evangelists, The Day of Pentecost, St. Paul, St. Peter, St. James, and 22 larger woodcuts to illustrate Revelation. Also the 2 woodcuts of the 2 Title-Pages. A full page contains 33 lines and there are 423 pages within, printed on both sides so that is 846, including the two title pages. References, subject-headings, and notes- a few of the last in roman type-appear in the margins. There are Prologues (Chiefly based on Luther’s ) to all the Epistles; that before Romans fill 34 pages. The Woodcut border of the first title page is framed with a blank shield at the base. That of the second title differs slightly, and the shield bears three graving tools and the initials M K, i.e. Martin de Keyser., Antwerp, Merten de Keyser (born Martin Lempereur; died 1536) was a 16th-century French printer and publisher working mainly in Antwerp, (Present day Belgium) for a long time in the 16th. century, Antwerp was part of the Netherlands, the Low Countries - Merten de Keyser printed the first complete French and the first complete English Bible translations as well as a number of works by English Protestant Authors. He died in 1536 the same year as William Tyndale. The Tyndale New Testament of Our Lord Jesus Christ of 1534 is complete in every way, with 423x2 pages,(846) and with no facsimiles pages within, none of the pages are trimmed, but the printing is very near the edges of many pages, and all yellowish pages are whole with minor cuts and tears and creases, no repairs appear anyway on or in the book, though the yellowish pages are very fragile and aged yellow-brown to the edges, a few, very minor hidden glue repairs to the spine when some of the pages appeared to separate from the spine, which would be normal to stabilise and protect the loss of pages and keep the book together. There are a few old antiquarian hand-written notes throughout and in the margins, but they do not interfere with the text. The aged patina brown leather parchment Binding appears to be original with a few faded scribbles and hand-written letterings to the front and back of the covers, the spine is dark brown and a layer of aged patina, with a crude hand-written, by knife, the name of Tyndall (spelled "Tyndall", rather then Tyndale) and the date, 1534 scrawled across the spine. The end papers are in situ and appear to be burnt to the edges as does a few of the edges of the book. The pages are very fragile and aged browned to all the edges, many creased. One of the end pages to the back of the book has antiquarian notes in a neat hand, to a blank page. Considering the age and rarity of this Book, its really in fine collectable condition. We at Tyndale Bible 1534 would be looking at serious offers for this unique, New Testament of Our Lord Jesus Christ;- Published in 1534 by William Tyndale/ Martin de Keyser. The Tyndale New Testament of Our Lord Jesus Christ of 1534, also conforms with Herbert’s Historical Catalogue of Printed Edition of the English Bible 1525-1961 and is Number 13 on the list. page 6 of Herbert’s . All the 39 woodcuts called for, are present, as is the Order of the Books, Index and two Title Pages, with the Date 1534 to the second Title Page. The Tyndale New Testament of Our Lord Jesus Christ of 1534; appears to be the original binding with old antiquarian hand-written notes, here and there within the old leather parchment binding. There appears to be old antiquarian hand-written notes, very faded, to the binding with the beginning of a few letters of a name, which we worked out is, we think;- Osney Abbey or Oseney Abbey, Now according to Tudor History a John Leland raided the Abbeys of England on the instructions of Henry VIII and stole all the books for his Master Henry VIII. The Tyndale New Testament of Our Lord Jesus Christ of 1534 shows the influence of Luther's 1522 German Translation, and was at times called, Luther's Testament in English. In the 1530s and 1540s, the royal library was reorganised to accommodate hundreds of books that were previously kept in monastic collections. John Leland himself describes how Henry's palaces at Greenwich, Hampton Court and Westminster, were adapted for the purpose. John Leland's part in this is uncertain. In humanist fashion, Leland styled himself antiquarius, a title which was at one time interpreted as referring to a formal appointment as "king's antiquary": however, it is now understood to have been merely Leland's own preferred way of describing himself. There is no evidence that he personally oversaw the relocation of the books to their new home or received a librarian's wages. What he did do was to compile his lists of important volumes, and to take measures to encourage their preservation. Even after the dissolution, John Leland did not abandon his hunt for books. The Printer, Merten de Keyser, in 1528, published William Tyndale's "The obedience of a Christen Man", and in 1530 Tyndale's "The Practyse of Prelates" as well as Tyndale's translation of "The Pentateuch". A year later Merten de Keyser, issued Tyndale's "Exposition of the fyrste Epistle of seynt Ihon", and George Joye's translation of "Isaiah", and also Tyndale's translation of "Jonah", the latter two apparently intended as a twin-publication. Thomas Abell's "Invicta Veritas", criticising Henry VIII's divorce, saw the light of day also in the workshop of Merten de Keyser in 1532. In 1533. Merten de Keyser printing house, posthumously printed John Frith's "Answer to Thomas More", which Frith composed while imprisoned in the Tower of London. In 1534 De Keyser printed the second, revised edition of Tyndale's "New Testament" as well as George Joye's new edition of the "Davids Psalter" based on Zwingli's Latin Psalter, and George Joye's translation of the book of "Jeremiah". These Old Testament translations were the first English translations of these biblical books ever in print. Furthermore, according to the discovery of Guido Latré in 1997, it was also Merten de Keyser who printed the first complete English Bible, known today as the Coverdale Bible. The place of publication of the 1535 edition was long disputed. The printer was assumed to be either Froschover in Zurich or Cervicornus and Soter (in Cologne or Marburg). Since the discovery of Guido Latré in 1997, the printer has been identified as Merten de Keyser in Antwerp. The "New Testament" were published in 1534 personally revised by Tyndale himself. Tyndale's "Pentateuch" was published at Antwerp in the Low Countries;- by Merten de Keyser in 1530. His English version of the book of "Jonah" was published the following year. This was followed by his revised version of the book of Genesis in 1534. Tyndale translated additional Old Testament books including Joshua, Judges, first and second Samuel, first and second Kings and first and second Chronicles, but they were not published and have not survived in their original forms. When Tyndale was martyred these works came to be in the possession of one of his associates, a John Rogers. These translations would be influential in the creation of the Matthew Bible which was published in 1537. Tyndale used a number of sources when carrying out his translations of both the New and Old Testaments. When translating the New Testament, he referred to the third edition (1522) of Erasmus’s Greek New Testament, often referred to as the Received Text. Tyndale also used Erasmus' Latin New Testament, as well as Luther’s German version and the Vulgate. 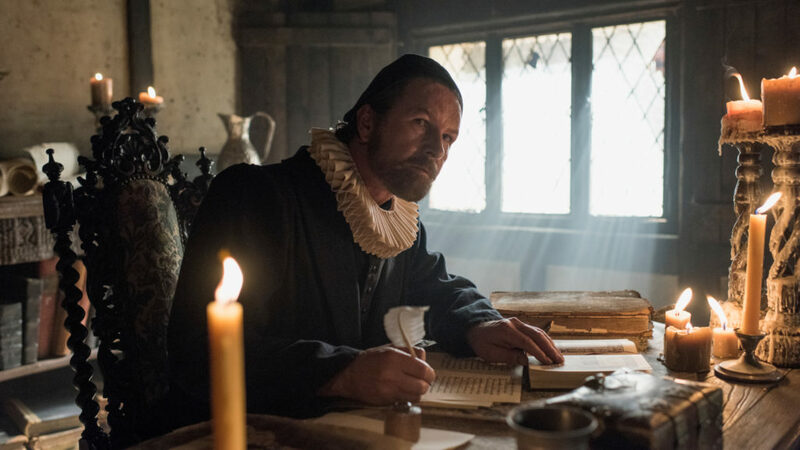 Scholars believe that Tyndale stayed away from using Wycliffe's Bible as a source because he didn’t want his English to reflect that which was used prior to the Renaissance. The sources Tyndale used for his translation of the Pentateuch however are not known for sure. Scholars believe that Tyndale used either the Hebrew Pentateuch or the Polyglot Bible, and may have referred to the Septuagint. It is suspected that his other Old Testament works were translated directly from a copy of the Hebrew Bible. He also made abundant use of Greek and Hebrew grammars. © COPYRIGHT images and video 2018. ALL RIGHTS RESERVED.